Negative SEO is a variant of marketing that has been exploited by aggressive or greedy business competitors seeking to actively undermine and attack their competition. SEO attacks could be compared to industrial or corporate espionage because it is sneaky, underhanded and sometimes nearly evil. Google has contributed to this insidious cancer by making it critically important who links to your web site and scoring the value of links, not just on a positive scale, but also allowing negative mark for each poorly scoring site that links to yours. I‘ve witnessed dramatic attacks by rapacious businesses seeking a search visibility advantage by attacking their competitors viciously and endlessly in a way that is sneaky and nearly invisible. Top rankings for important keyword phrases suddenly start sinking inexplicably with no apparent reason. Then, using external tools you may discover long lists of junk sites linking to important pages, sometimes deep linking to product detail pages on ecommerce sites. At first it may be difficult to discern patterns, but usually with some digging it becomes apparent who is to blame for that negative link building. When you are the target of negative link-spam campaigns it can be quite a challenge to disavow seemingly endless numbers of spammy, toxic links. If the attacker is persistent and effective, it can seriously damage search visibility long-term and make recovery imperative for continued business success. Conversely, it is very clear that the attacker will see gains in their search rankings since they are attacking specific keyword sets. When a previously unranked site starts jumping into strong positions, it’s apparent they are likely involved in a negative link-spamming attack. So – what to do? First step – Google Disavowals. As mentioned above, several available backlink tools make it very clear that spammy or nefarious sites are linking to yours. In response to link-spam, Google made it possible to disavow the bad guy domains and remove the penalties that come from all that garbage referencing your site in links. Many times, they are adding your content to sites stealing media files such as photos, docs or PDF files by linking directly to them on your server – costing you bandwidth. Other times they are adding content snippets or linking keyword focused content aggregated from long lists of sites focused on ranking content in order to gain advertising revenue. Whatever the reason or methods involved, you must make it clear to Google that your site is not affiliated with the junky stuff linking to your business site and products. Google gives you the option to disavow domains, sub-domains or individual pages. They want to see that you made an attempt to get links removed before disavowing – but reaching out to low-life sites is sometimes either counter-productive or a huge waste of time and energy. Not to mention continuing loss of sales while you wait for responses. You can ask those that are stealing your content to stop linking directly to your media files if they seem at least somewhat reputable. Disavowals are valuable for sites that may have been attacked specifically targeted to hurt ecommerce sales and will help restore lost revenue within 30 to 45 days after submitting your list to Google. Disavowal is also worthwhile for sites that have simply been around awhile and have accumulated links from a few junky sites along the way. Maybe there were some early attempts at link-building by unwise or unknowing junior SEOs that submitted your site to anyplace that offered links, without regard to quality or relevance (I’ve seen quite a few examples of this). In any case, link disavowing is valuable to keep your slate clean by erasing accumulated junk from the link graph. 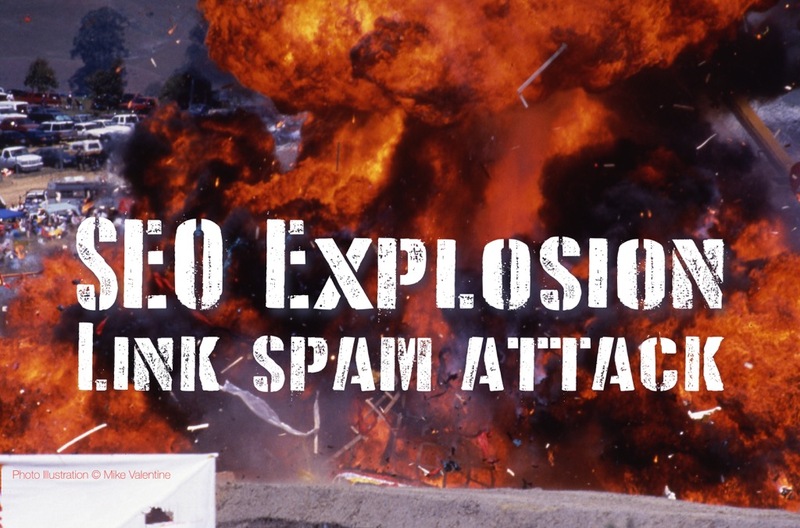 Purposeful attacks by bad guys are the worst case scenario – but whether you are cleaning up from an explosive link bomb campaign or simply cleaning house, it’s a good idea to do the work to clean up the mess, then polish up your backlink collection. This work is best left to an SEO team with access to expensive specialty tools that gather extensive data to analyze and sort and prioritize backlink info. The time involved can be excessive without those useful toolsets. There are also prospecting and outreach tools to gain new, relevant and worthwhile backlinks that help tilt the landscape back toward level. That assumes that the bad guys don’t continue to target you by aiming their attacks at your valuable keywords. If you have experienced unexplained drops in search engine visibility, particularly if you were previously well positioned and you have not recently redesigned or significantly updated your ecommerce site – we’d be glad to look into details and help with recovery. If you’d like to invest in recovering a clean link profile, contact us.